Tomato soup is one of those foods you love from childhood. Did you know you can enjoy it fresh and homemade? It is simple to make, and tastes so much better than from a can. One bite of this homemade soup, you are going to toss the can, and be amazed at what you can make. 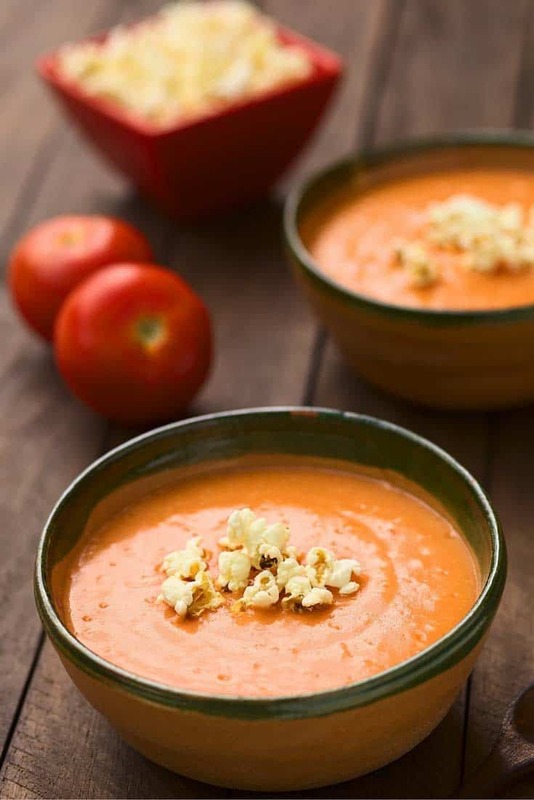 This recipe for easy tomato soup is very simple; you will need some fresh tomatoes, onion, some heavy whipping cream, vegetable oil, and some salt, and pepper. That’s all you will need. Don’t you love it when a recipe is as simple as this? This recipe is vegetarian and gluten free friendly. So even people with unique dietary requirements are going to love this recipe. What I love about this soup recipe is that chances are you already have most of this in your pantry. I always keep onions, vegetable oil, salt, and pepper at home. I typically buy fresh tomatoes and heavy cream when I need them. So a quick trip to the store and you are in business. The tomatoes do need to cook in the oven for awhile, so I like to start those first. When they are about done cooking that is when I saute my onions. Cooking doesn’t always mean you are standing at the stove the whole time. When the soup is done, you might want to serve this with a grilled cheese sandwich, or you toss in a few croutons. I know you are going to love how easy this is to make easy tomato soup. You never knew it was so easy to make homemade soup like this before. Love this homemade soup? Here are more great recipes to try. You don't need to buy a can of tomato soup when you can make it from scratch. Preheat oven to 400 degrees. Wash tomatoes and slice in half. Lay tomatoes skin side down on a baking sheet. Drizzle with olive oil and sprinkle salt and pepper on the tomatoes. Bake for 75 minutes.When the tomatoes have about 10 minutes left in their baking, chop onion and place in a large heavy pot. Add 1 tablespoon olive oil and a 1/2 teaspoon salt. Saute the onions over medium heat. Add the tomatoes to the pot. Add 1 cup heavy cream, and 1 1/4 cups of water. Bring to boil then simmer for about 25 minutes on low. To make the soup smooth and creamy puree soup with a blender. Garnish with whatever you like. This soup was so good with a grilled cheese sandwich. Your right, there aren’t three ingredients in this soup. I have modified the text. I am sorry about the confusion. I love this recipe. I actually smoked my tomatoes then grilled them. It came out so Yummy! So easy to make. Thank you for posting this recipe. Bake the tomatoes for 75 minutes. That seems like a long time to me but I’m anxious to try this recipe so I thought I should check. Thanks in advance for your reply. Tomatoes can very wet, and cooking out the water, can take some time. Saw a video on epicurious that was this same recipe. Video didn’t have the details so I found your website. Very impressed how this came out. I’m sure a can of crushed tomatoes would be cheaper than out-of-season roma tomatoes, but it was fun doing the roasting. At whole foods I have purchased cans of roasted tomatoes, but the fresh ones are better. Love, Love and more love for your channel and the Recipes, but not the loud music. Please no more loud music.